Of all the legendary names in the history of the Ford Mustang, one stands apart: BOSS. Originally created to homologate the new Boss 302 engine and option package for SCCA Trans-Am racing, the Mustang Boss 302 debuted for the 1969 model year and was built in limited numbers for the street through 1970. Designed by the legendary Larry Shinoda, the Boss cars were easily distinguished from their less potent stablemates by their race-bred powerplant, standard front spoiler, and bold graphics. In 2012, Ford at long last revived this most revered of all Mustang models. With a new racing counterpart and a modern street version that delivers more than 440 horsepower, the Boss is truly back! 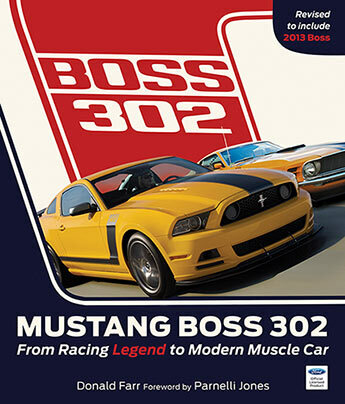 In Mustang Boss 302, to mark this historic occasion and the introduction of the 2013 version, Mustang historian Donald Farr offers a complete history of the car - from its late 1960s origins in Ford's boardrooms through its Trans-Am successes and untimely demise in 1970, up to the conception and development of the spectacular new 2012 and 2013 Mustang Boss 302. Packed with brilliant photography and firsthand accounts from the people who created the original Boss, as well as the team that resurrected Ford's most iconic Mustang, this is the story every Mustang enthusiast has been waiting to read. Donald Farr has been on staff at Mustang Monthly Magazine for 30 years. In addition to his magazine work, Donald authored Mustang Boss 302: Ford s Trans-Am Ponycar and co-wrote How to Restore Your Mustang with Mustang Monthly founder Larry Dobbs. He currently owns the 1966 Mustang GT that his grandfather purchased new. Rufus Parnell Parnelli Jones is an American racing legend. As a driver, he has won races and championships in a wide variety of machinery, including sprint cars, midget cars, stock cars, off-road vehicles, sports cars, Trans-Am cars, and Indy cars. A winner of three Indy 500s (one as a driver, two as a car owner), among his many other career highlights was winning the 1970 Trans-Am Championship in a Mustang Boss 302.As editor of Mustang Monthly magazine, Donald Farr has been researching and writing about Mustangs for over 30 years. In addition to his magazine work, Donald authored Mustang Boss 302: Ford's Trans-Am Ponycar and co-wrote How to Restore Your Mustang and the Mustang Recognition Guide with Mustang Monthly founder Larry Dobbs. Donald was inducted into the Mustang Hall of Fame in 2012.